To celebrate the official launch of production of the new Cadillac ELR, GM invited some of their factory backed drivers scheduled to run in this weekend’s Detroit Belle Isle Grand Prix to swing over to Hamtramck for to witness the company’s newest electric car being born. Both Chevrolet and Cadillac will have entries in the Belle Isle Grand Prix and including in the group of drivers to visit the Hamtramck plant was IndyCar driver Simnoa de Silvestro. In addition to being a Chevrolet Racing team driver, de Silvestro is also a proud Chevy Volt owner. It should be noted that the Cadillac ELR coupes rolling off of the Hamtramck assembly line right now are not for-sale units but instead, these are the final preproduction models that will be used for engineering testing and evaluation. These are the ELRs built in the same way that the normal production cars sold in dealerships around the country will be built and over the next few months, GM engineers will make sure that these electric Caddy coupes can stand up to the rigors of consumer use. The normal production units that will be sold to the general public will begin rolling off of the assembly line later this year to meet an expected sales launch in the fall. For those who are unsure, the 2014 Cadillac ELR is a high end luxury coupe based with a basic chassis design along with the Voltec drivetrain from the popular Chevrolet Volt – which is also built at the Hamtramck facility. 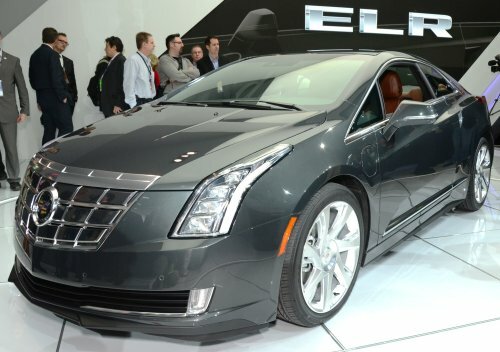 The ELR differs the most from the Volt in the fact that it is a 2-door fastback coupe as opposed to the 4-door sedan styling of the Volt but it is expected that the ELR will feature the exact electric drivetrain featuring a range extending gasoline engine that has made the Volt America’s bestselling electric vehicle. The ELR will likely offer similar all-electric and overall range limits to the Volt but we expect that the sporty Caddy coupe will have slight tuning differences to deliver a more engaging driving experience. Most importantly (for General Motors), the 2014 Cadillac ELR can sport a price tag high enough to allow GM to actually make money on a Voltec powered vehicle. It has been regularly reported that GM loses money on every Volt sold because the company cannot get away with charging more than the low $40k range. However, the Cadillac brand vehicles naturally carry a higher price tag so while the ELR may cost GM a little more to produce than the Volt due to all of the high luxury interior amenities – the company can safely price the electric Caddy coupe high enough to make money without running off buyers. People who are buying a Cadillac are prepared to pay upwards of $60k for a high end luxury car and that almost $20k difference between itself and the Volt should help GM aim for profitability from the Voltec drivetrain. After all, with so many high end luxury coupes carrying $60k price tags, the ELR could prove to be the best deal considering the possibility of saving huge chunks of cash at the pumps.